After careful selection I've come up with an extremely plug-n-press-record system that fits into a shoebox will screen record for Mac, Linux, and even Windows with no installation or considerations (other than mic battery). Total cost is between $300 and $400, depending mostly on how good of a mic you want, but also a few other factors. This works stand-alone. There's a bluetooth version for the same price, but simpler is probably better. Be careful to get the older firmware version (such as used). NOTE: It's about 3.5 GiB per 45-min presentation. You'll want 2 if you're going to swap and begin uploading while the next presenter is presenting. Otherwise you'll want the 16GB. If you really need a talking head to put in the corner of your videos, you'll also need to get a standard camera tripod with an iPhone mount and use Screenflow to mux the presenter with the recording. Your xbox or laptop is transmitting in Ycbcr or ypbpr instead of RGB... it's deep deep deep in the settings, you'll probably just have to deal with it. 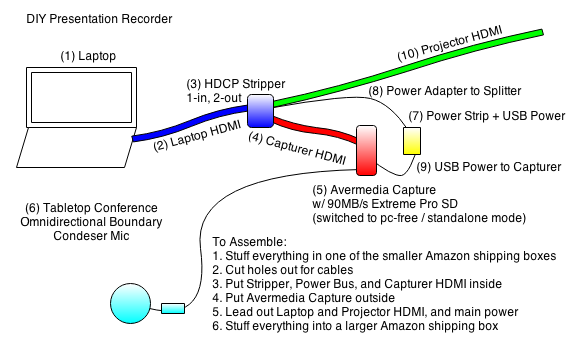 There are a lot of solutions for recording conference sessions, lectures, screen-caputure of presentations, etc - but they're either cumbersome or expensive and, as an aside, none of the ones that work are legal (due to HDMI's HDCP encryption). Of these Google Hangouts is actually a suitable alternative, as long as your members are vigilent (and let's face it... they aren't). Google hangouts gets it's own category because it's actually usable since they added HD recordings. As an added perk, it streams to YouTube live. Upshot is that it has all the bells and whistles. The downshot is that bells and whistles imply complicated. Also, it's hella expensive ($2000!!!) and I don't believe they crack HDCP, so you still couldn't record from a Mac from HDMI - but DVI (same resolution and quality) should work fine. These start to hit the sweet spot in terms of bang for buck. Some have terrible reviews (Roxio et al), but the Elgato looks great. The downside is that all of them (excepting the AverMedia - the one I use in the DIY kit) require a dedicated computer to manage the recording.